This past few weeks saw us working in Arpino, Alvito, Sora and San Donato. We were able to take family trees back into the parish records, providing digital images of the records and adding the detail on the sources we used so you can record the images correctly in your family tree program, and providing a GEDCOM file of the research so you can see where everything fits. 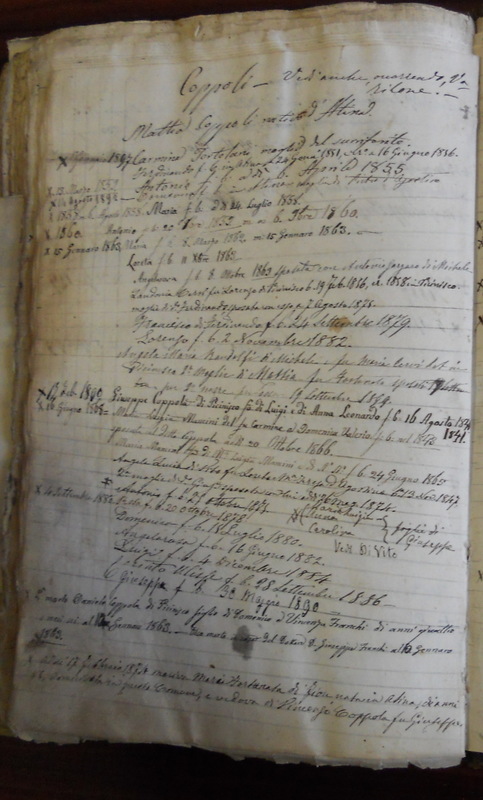 Many anagrafical records such as the Register of the Population and parish census records contain many names which are not always arranged in a logical way. Our experience in reading and interpreting these records means that we can group the families for you in the GEDCOM, so you can refer to it when studying the images yourself. One client, who keeps her family tree at an on-line website, didn’t want a GEDCOM she wanted a transcription so she could add the information herself. We can do that for you, but a transcription doesn’t interpret the document. It doesn’t put the families into groups or tell you what all the notations mean and if you aren’t familiar with what you are looking at it may not help you keep everyone straight. I sent her a descendant, narrative report, produced by Legacy Family Tree which gave her all the family members neatly put into their proper family groups. Using this she could then add the information in the correct places. I commend this client for wanting to do the entry herself, in fact, I recommend it. It will keep you in the loop and make you feel part of the process when you can’t go on-site to view the originals. We do the data-entry for you but also for ourselves. If you ask us to continue the search into the next stage, we have everything we need at the point where we left off, even if it’s several months later. Working from Pedigree charts and family group sheets mean we work efficiently on-site. Entering the information into the GEDCOM means we pick up on any incorrectly identified records we may have gathered in error during the search. If you catch me out in an error I will give you a 25 Euro credit! What I do recommend is that you keep your full and complete family tree on your own computer, backed up to an external hard drive or the ‘cloud’. If that on-line company has a crash, or goes out of business you may lose everything you have worked so hard to accomplish. And, just so you know, I keep your GEDCOM and images archived in Dropbox just in case a disaster happens. I have been able to ‘save’ several clients’ life work by providing a copy of this back-up free of charge! www.dropbox.com gives new clients 2GB of free space which should be enough for most basic needs. Thank you for the valuable tips. Great to know. Also my family is from Alito.